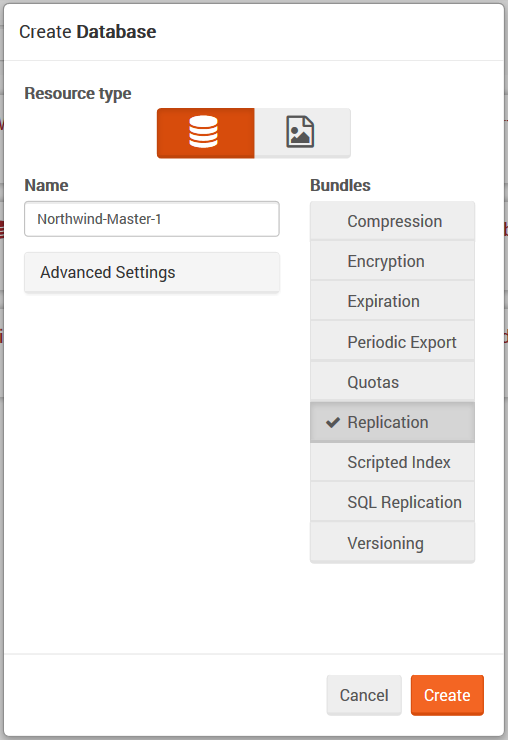 Below a step-by-step guide will demonstrate how to quickly setup master-slave and master-master replication between the databases using the Studio. To setup a master-slave replication, this is to replicate documents from one database to another, we need to have two databases (they can be on the same or different servers). For our purposes, we will create two separate servers. The first one will be our master server and will run on port 8081. The second one, the slave server, will run at 8082 port. first, we need to have a database that we want to replicate to another server. This database must have a replication bundle enabled. Let's call it Northwind-Master. to setup replication, we need to go to our Replication Settings View and add new replication destination using the Add destination button. Here we need to provide information such as the URL of the destination server (http://localhost:8082/) and the name of the database there (Northwind-Backup). you will notice that two documents have been created. The first one is called Raven/Replication/Destinations, and you will find your replication configuration there. The second document is called Raven/Replication/Destinations/localhost8082databasesNorthwind-Backup and it has been created because RavenDB detected a problem with replicating documents to slave, which is expected because we haven't configured it yet. there is only one step here: you need to create a database with replication bundle turned on. on the slave server go to Documents View and, if all went well, all documents from the master server should be there. Note that replication process might take some time. To setup a master-master replication, this is to replicate documents from one database to another and backwards, you need to have two databases (they can be on the same or different servers). For our purposes we will create two separate servers. The first one will run on port 8081, and the second one on port 8082.
first, we need to have a database that we want to replicate to another server. This database must have a replication bundle enabled. Let's call it Northwind-Master-1 and fill it up with sample data. to setup a replication, we need to go to our Replication Settings View and add a new replication destination using the Add destination button. Here we need to provide information such as the URL of the destination server (http://localhost:8082/) and the name of the database there (Northwind-Master-2). you will notice that two documents have been created. 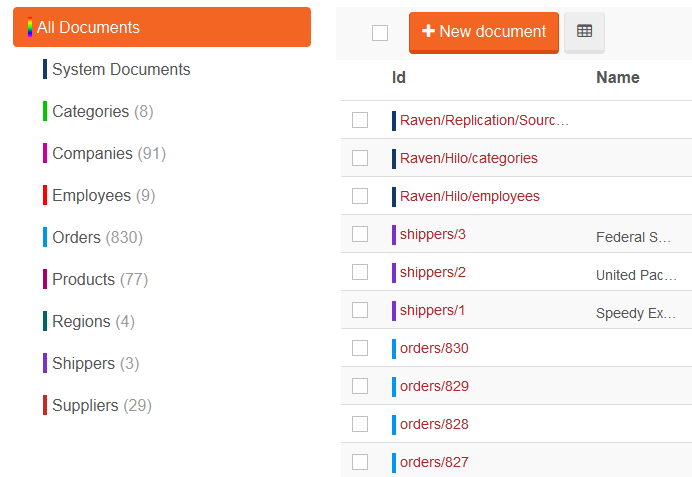 The first one is called Raven/Replication/Destinations and you will find your replication configuration there. The second document is called Raven/Replication/Destinations/localhost8082databasesNorthwind-Master-2 and it has been created because RavenDB detected a problem with replicating documents to slave, which is expected because we haven't configured it yet. 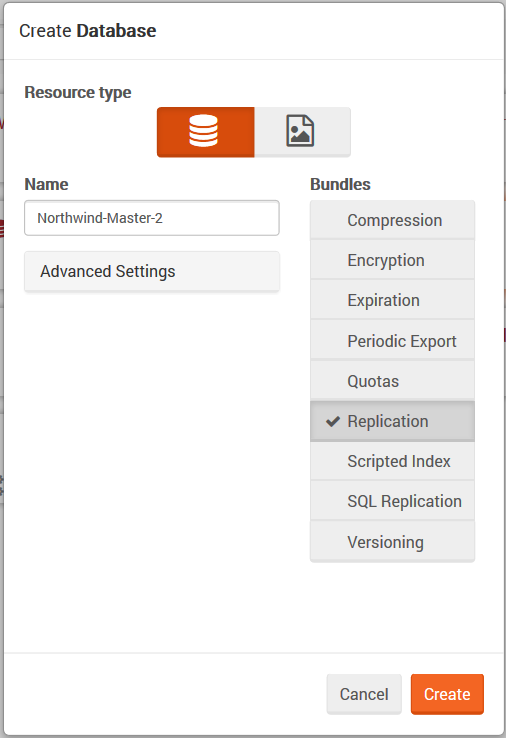 open the Studio on the second master server and create a new database called Northwind-Master-2. Remember to enable the replication bundle. 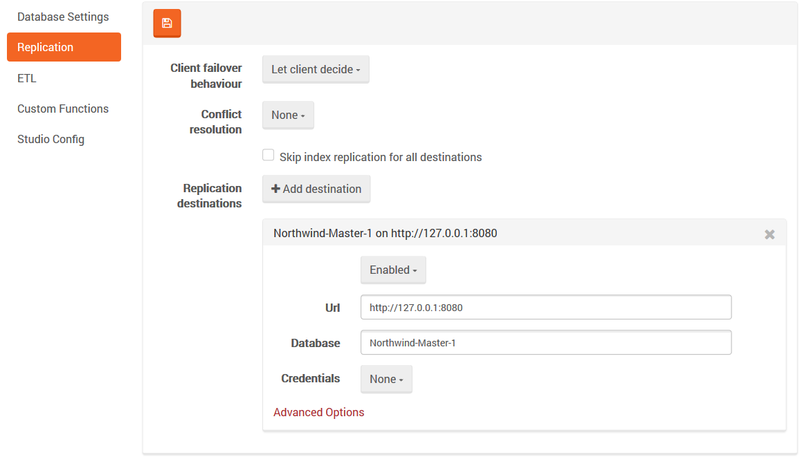 setup a replication to your first master server by going into Replication Settings View and adding new replication destination. 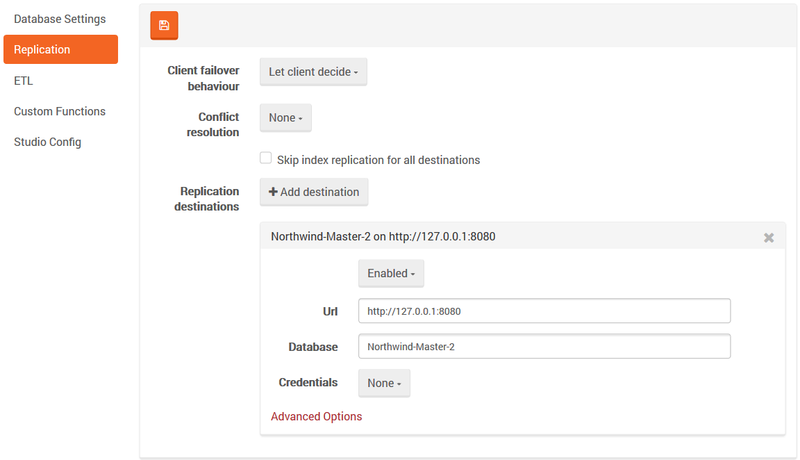 In our example we need to use http://localhost:8081/ as a server URL and Northwind-Master-1.